Rosemary is one of those plants that multitasks very well. It grows in hard-to-grow places, such as rocks and dry areas. And it provides you with a seasoning that can flavor your food all year long. Rosemary is great for seasoning poultry, lamb, stews and soups. Rosemary is a member of the mint family. The Greeks and Romans noted its medicinal uses and mystical properties. 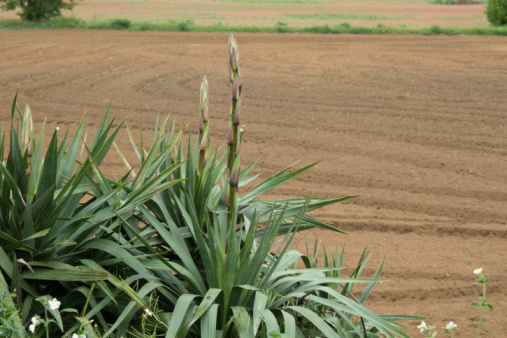 In folklore, it was thought of as a plant that could ward off evil spirits. The best time to plant rosemary seeds or cuttings is after the last spring frost date. The U.S. Department of Agriculture has a plant hardiness zone map that will help you determine that date. If you want to get a head start, you can plant seeds or cuttings indoors, eight to 10 weeks before the last spring frost. Rosemary grows best outside in Zones 6 through 9, and it thrives in warm, Mediterranean-type climates. Rosemary may survive the winter and return in the spring, especially in Zones 7 through 9, and possibly in Zone 6 if planted in a sheltered area. If you live in an area with very cold winters, however, you can plant your rosemary in a container and bring it indoors for the winter. Rosemary grows very well indoors. Rosemary grows very well from cuttings. When planting outside, plant your rosemary in well-drained soil that is about 70 degrees Fahrenheit. Choose a spot that gets at least six to eight hours of sunlight each day. If your soil is heavy and wet and doesn't drain well, consider planting in a raised bed. Make sure your plant has plenty of room to breathe and spread. Rosemary will grow about 4 feet tall and equally as wide. Good companion plants for rosemary are beans, cabbage, carrots and sage. When the plant flowers, trim the flowers. Water deeply once or twice a week throughout the growing season, depending on the weather. Do not overwater. In very wet, heavy soil, rosemary is subject to root rot. Prune the stems when the plant starts to look ragged. That will give your plant a nice, bushy look. Try to cut above a leaf joint, and prune no more than one-third of the entire plant at a time. Prune out any dead-looking stems. Fertilize occasionally with fish emulsion. In the spring, use a slow-release fertilizer. Rosemary has a wonderful scent and is a popular indoor plant. 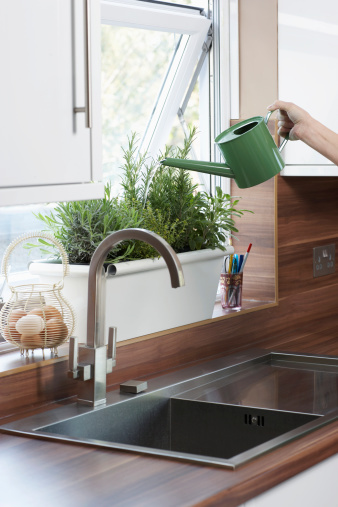 If you're growing rosemary in a pot, let the plant dry out each time before watering again. Put your finger into the soil a couple of inches deep. If it feels dry, you can probably water. Also, choose a sunny indoor spot so the rosemary gets six to eight hours of sunlight each day. It's a good idea to rotate your indoor rosemary plant so all sides get plenty of sun. If you decide to plant your indoor rosemary outdoors in the spring, remove it from the pot, cut away dead and circling roots and break up the root ball before planting. Rosemary grows very well from cuttings. Cut a 6-inch piece of new growth from an established plant. Remove the bottom leaves from the bottom 3 inches and dip the base in rooting powder. Put the cutting into dampened, soil mix with good drainage. Soil mixed with equal parts perlite and peat moss does well. You should have root growth in two to three weeks. Rosemary can suffer from powdery mildew, which is a white, powdery fungus that develops in humid areas with little air circulation. It won't kill the plant, but it could weaken it. You can lessen the chance of your plant getting powdery mildew if you keep it pruned and make sure it has plenty of room. Red spider mites and black aphids can also attack rosemary, especially in winter. You can control these pests by spraying with an insecticidal soap, although you may have to spray your plant repeatedly. Rosemary can be rubbed on pork and used in chicken, lamb and veal. It is also an excellent addition to stews, soups and vegetable dishes. 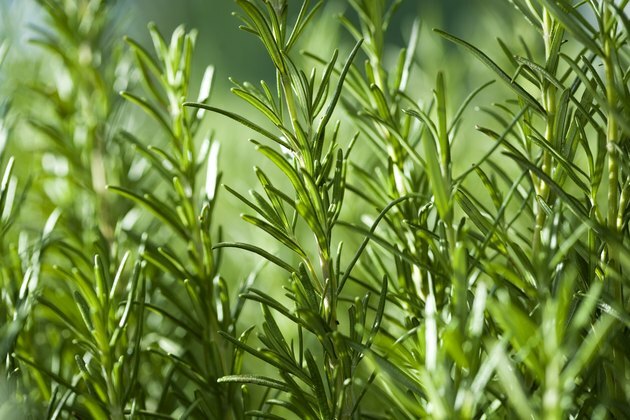 Rosemary can be used as a flavoring for grilled bread and can be used in a marinade with wine, olive oil and garlic. Rosemary is a popular herb with cooks and can be very expensive to buy in quantity. Growing rosemary can be an inexpensive way to provide some texture to your garden and some flavor for your food.